Where to find Caldaro Sulla Strada del Vino hotels near an airport? Where can I find hotels in Caldaro Sulla Strada del Vino that are near tourist attractions? From the cheap and cheerful to the more exclusive, Caldaro Sulla Strada del Vino features a wide range of quality lodging options. The Expedia database features 20 hotel options within a 0.1-kilometre (0.06-mile) radius of downtown Caldaro Sulla Strada del Vino. If you want to stay within a short drive from the middle of Caldaro Sulla Strada del Vino, the Hotel Masatsch could be an excellent option. 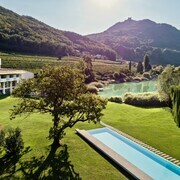 Check out the Hotel Castel Fragsburg and the Hotel Pfösl. The Hotel Castel Fragsburg is 25 kilometres (17 miles) from the heart of Caldaro Sulla Strada del Vino. 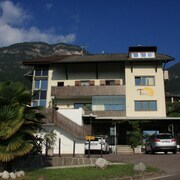 The Hotel Pfösl, is positioned 15 kilometres (9 miles) away. 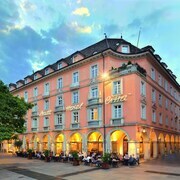 Alternatively you could make a reservation at the Romantik Hotel Turm or the Romantik Hotel Oberwirt. Merano Historic Center is 30 kilometres (20 miles) to the north of Caldaro Sulla Strada del Vino and is where you'll find Merano Theatre and Merano Christmas Market. Should you wish to spend a night or two in Merano Historic Center, check out the Park Hotel Mignon and Hotel Terme Merano. 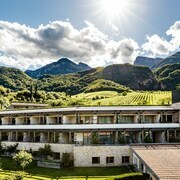 Alternatively, you could consider staying at Alpe di Siusi, 30 kilometres (17 miles) to the northeast of Caldaro Sulla Strada del Vino, where you can choose from the Parc Hotel Miramonti and Hotel Waldsee. The Lake Fie and Proesels Castle are just some of the more popular points of interest to explore should you visit Alpe di Siusi. If enjoying sport is what you love, be sure to visit PalaTrento, which is 40 kilometres (25 miles) to the south of Caldaro Sulla Strada del Vino. Those sports fans wanting to sleep near to the action can choose from the Aquila d'Oro or the Hosting Culture Hotel Accademia. 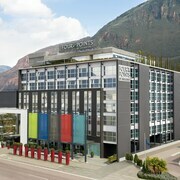 Bolzano Airport can be found 10 kilometres (6 miles) away from Caldaro Sulla Strada del Vino. 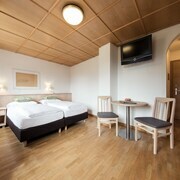 If you choose to stay close by, can easily book a room at the Hotel Greif or the Parkhotel Laurin. What are the most popular Caldaro Sulla Strada del Vino hotels? Are there hotels in other cities near Caldaro Sulla Strada del Vino? What other types of accommodations are available in Caldaro Sulla Strada del Vino? Explore Caldaro Sulla Strada del Vino with Expedia.ca’s Travel Guides to find the best flights, cars, holiday packages and more!